Some journalists search the truth of a case; Lee Strobel is searching for the truth of everything. The Case for Christ is the story of that search. A relentless journalist at the Chicago Tribune, Lee Stobel is the award-winning newspaper's rising star. With a reputation for taking a hard look at the facts, and not allowing himself to be clouded by emotion, falseness or surrender, he is as much feared for his unstoppable pursuits as he is respected. A fervent atheist, cold facts are what have guided his career to this point, as the newly appointed legal editor at the paper. But all that is turned on it's head when his wife turned against his worldview view of hard truths and nothing more. Refusing to allow his own wife to take part in this absurdity, but without wanting to lose her in the process, he sets out to prove a case like no other: that there is no evidence for God, no evidence that Jesus is who he said he was, and no evidence of anything more than what can be seen and touched. Committed to cutting through the flimsy evidence and superstition that he sees in Christianity, Strobel's search quickly becomes the biggest story of his career. But what if he was wrong? What if there really is a Case for Christ? 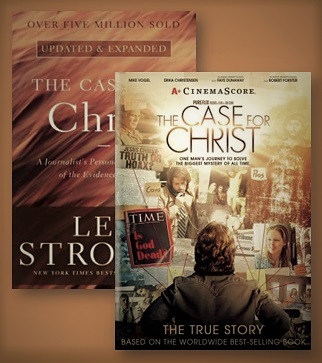 Based on the bestselling book of the same name, The Case for Christ tells the story of Lee Strobel's search for the truth. Starring Mike Vogel, Erika Christensen, Faye Dunaway, and Robert Forster, the films is a thrilling race for meaning, and the perfect movie for families and Church groups. It's the perfect film for anyone who has questions about Christianity. Do you believe the Case for Christ? A seasoned journalist chases down the biggest story in history Is there credible evidence that Jesus of Nazareth really is the son of God? Retracing his own spiritual journey from atheism to faith, Lee Strobel, former legal editor of the Chicago Tribune, cross-examines a dozen experts with doctorates from schools like Cambridge, Princeton, and Brandeis who are recognized authorities in their own fields. Strobel challenges them with question like How reliable is the New Testament? Does evidence for Jesus exist outside the Bible? Is there any reason to believe the resurrection was an actual event? What documentation is there concerning the life and teachings of Jesus, and how reliable is it? Does archaeology substantiate the historical accounts? Did Jesus really perform miracles? Did he claim to be God-and if so, did he fit the profile? Strobel's tough, point-blank questions make this Gold Medallion-winning book read like a captivating, fast-paced novel. But it's not fiction. It's a riveting quest for the truth about history's most compelling figure. What will your verdict be in the The Case for Christ? The Case for Christ bundle by Lee Strobel was published by Eden bundles in November 2017 and is our 1187th best seller. The ISBN for The Case for Christ bundle is EDENBUNDLE-2013. Be the first to review The Case for Christ bundle! Got a question? No problem! Just click here to ask us about The Case for Christ bundle.